Professional Engineering License in a new State? Properly licensing your engineering firm to do business in multiple states is time consuming for companies to handle in-house. Professional Engineering licenses for individual engineers employed by the firm. These licenses may require education, experience, and testing. One issue that firms face is ownership licensure requirements. Most states either do not have ownership requirements or require one owner of the firm be authorized to practice in that state. However, New York and Michigan are different in this way. In Michigan, for an out of state to practice in Michigan, two-thirds of the firm’s principals need to be licensed as professional engineers in Michigan. See more at Michigan Professional Engineering Firm. New York requires that greater then 75% of domestic firms and 100% of foreign firm’s shareholders, officers, and directors be licensed as professional engineers. Although only those engineers who will be actually providing professional services must be licensed in New York State, the rest must be licensed in some other jurisdiction. This is problematic for many firms that have mixed ownership. For such firms to practice in New York, they may need to set up a new, separate corporation, meeting New York State’s ownership requirements. See more at New York Design Professional Corporation and New York Foreign Professional Corporation. Another issue that firms face is the unique name requirements which may limit the names under which a firm may provide services. Applications may be denied if your firm name conflicts with the specific requirements of a state. Engineering firms may need to alter their “doing business as” name in the state to prevent denial. Finally, professional engineering firms may also be subject to local business licenses, payroll taxes and sales taxes. LicenseLogix understands the requirements in each state and will save your company dozens of hours of research and application preparation. Learn more about our License Research and License Filing services. We streamline the licensing process to get you licensed fast and keep you in compliance. 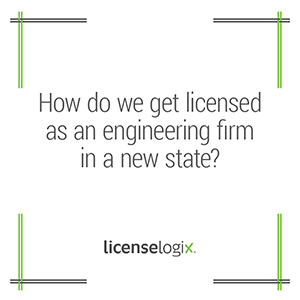 LicenseLogix will navigate the license requirements for professional engineering firms by helping you obtain all the licenses and registrations you need and manage your ongoing license renewals. For a free consultation, fill in the form to the left contact us or give us a call at (800) 292-0909.